Want to pull an impressive weight off the floor or hoist it over your head? The secret lies in your lats. Use these two simple drills to harness your back's powerful stabilizers! Occupation: Co-founder of Cressey Performance. Ever watch an elite Olympic weightlifter train? I don't recommend doing so if you want to preserve any level of self-esteem in the weight room. Once you get over the inevitable jealously and resentment of watching someone toss your squat 1RM over their head like a paperweight, you inevitably ask yourself, "How did they get there?" I'm no Olympic lifting coach, but I can give you a short answer: They started with an empty bar or stick, then added weight. Now here's the longer and more accurate version: They learned a complicated movement, then, after adding weight, they saw that they still had a lot to learn. So they broke the movement down into manageable parts and focused in on the part they sucked at most. Then they hit those parts with strategic movement drills. You don't need to be a big-W weightlifter to benefit from their approach. Here are two potentially game-changing drills for complicated, non-Olympic lifts that are considered impressive displays of strength: the barbell deadlift, and the kettlebell get-up. "What separates the deadlift from the squat and bench press is that you can't cheat a deadlift." 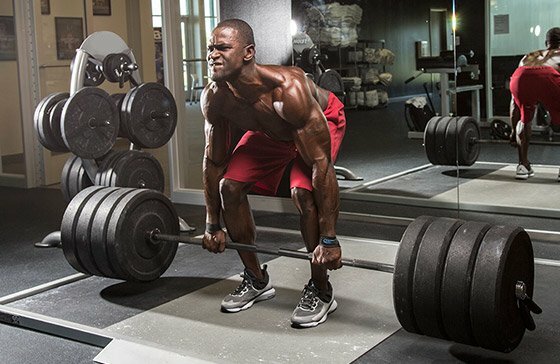 What I feel separates the deadlift from the squat and bench press is that you can't cheat a deadlift. Squat depth is always subjective, because what's "parallel" to one person is laughable for the next person. And despite your training partner yelling "All you, all you, all you" on your last set of bench press, was it really? With the deadlift, though, either you lock that weight out, or you don't. There's no in-between; it's just you and the bar. And as the amount you're pulling goes up, the amount of bad form you can safely get away with goes down—fast. There are countless coaching cues to juggle when trying to make a solid pull— neutral spine, take the slack out of the bar, chest up, groove a hip hinge, heels into the floor, don't poop your pants, to name a few. They're all helpful, but many of my beginner and intermediate lifters benefit just as much from a simple drill to help them engage their lats to a higher degree. While the anatomy geeks reading this know that the lats adduct, extend, and internally rotate the arms, that's actually only part of the picture. They also play a massive role in spinal stabilization. The sooner I get someone to engage his or her lats during a deadlift, the sooner they'll see a vast improvement in both technique and performance. Attach a pair of Jump Stretch bands (or something similar) to a stable base at around chest height. Grab the bands with each hand and pull until there's a fair amount of tension in each. Pull the band to your sides or slightly in front of body, as if you're holding a barbell. You should feel your lats engage here. Perform a deadlift-style hip hinge while maintaining tension in both the bands and lats. Play with this until the feeling becomes second nature, and you're totally on your way to crushing a solid deadlift pattern. If there's one exercise that makes the bulk of my athletes and clients groan the most, it's the get-up. I had an athlete ask me recently, "What does this even do, anyways?" My answer (in my head): "Dude, just shut up and do it." My answer (out loud): "What doesn't it do?" As I explained in my article, "Everything You Know About Corrective Exercise is Wrong," some movements get the "functional" reputation even though they don't have anything to offer healthy athletes. But others deserve their popularity, like the get-up. It works a plethora of things that can benefit all types of athletes: rolling from supine to half-kneeling, maintaining core stability, glute activation, hip mobility, hip extension, scapular stability, the lunge, and overhead pressing, to name a few. There are a lot of moving parts to the exercise—473 or so, give or take—so I can understand why the get-up is intimidating. Especially because the hardest part for most people is the very first step—the roll from the floor up onto the elbow. How could such a short motion be a problem? In my experience, it's because people try to do it like an abdominal crunch, which is wrong. You may be able to cheat your way up with a light weight, but once you get a pood or two up over your head, you'll definitely find yourself struggling. Unfortunately, the most popular cue, "roll and punch the ceiling," only works for about 50 percent of trainees, if that. Revisiting the theme from above, helping people to learn to turn on the lats plays a key role here. This drill hammers it home. Lay a heavy(ish) kettlebell on its side so that the hand of your down arm is holding the handle. Initiate the movement by pulling against the bell, using it as an anchor. You might initially drag the kettlebell toward your torso, but resist the urge. Drive your elbow into the floor when doing the roll. Do this a few times, and you'll realize that the roll requires a pulling motion with the down arm, not just a pushing motion with the up arm. Add the drill to your get-up practice, and you'll be doing the movement unassisted like an old-time strongman in no time. Fig leaf bikini and moustache wax are optional. Tony Gentilcore is a strength and conditioning specialist through the NSCA and is the co-founder/co-owner of Cressey Performance.